In a medium skillet, brown turkey until it loses its pink color. Drain off any fat and combine with salsa. In a medium mixing bowl, combine cottage cheese, mozzarella, cumin, chili powder, salt, black pepper, and cilantro. 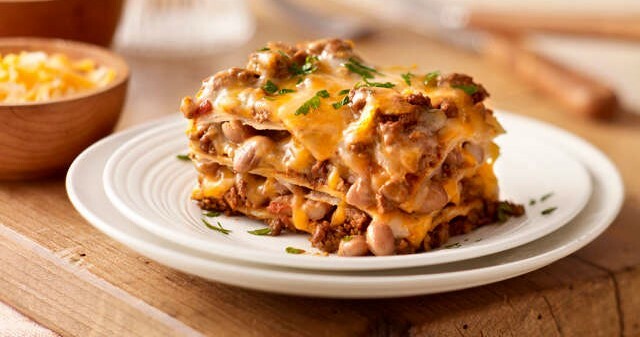 In a 9 x 13-inch casserole dish, layer with half of each: meat mixture, cheese mixture, and tortilla pieces. Repeat layering and sprinkle with cheddar cheese. Cover loosely with foil and bake 30 minutes, or until cheese is melted and casserole is heated through. Remove foil and bake an additional 5 minutes. Allow to rest 5-10 minutes before serving. Garnish with additional cilantro.